Swimrun and pub done it was time to hit the hay. Henriette and I had hired a van which we chucked a mattress in to act as our form of transport and accommodation. Both feeling full and happy we found a car park for the night and passed out. The Sunday plan was to do some nice running on some English fells, so at about 10 in the morning we headed into Keswick to fill up with a big English breakfast. Content and ready to plod up some hills we drove to a car park looking for phone signal. Pulling up we could see people milling around with race numbers on. I was immediately interested and found someone to give me the low down. Turns out it was the Skiddaw fell race. The start was in an hour, there was a kit list and it cost £7 pound to enter…that’ll do I thought. Running into town I purchased a hat which was the only bit of kit I was missing. I then got myself entered, tried to figure out where the course went and see about warming up. 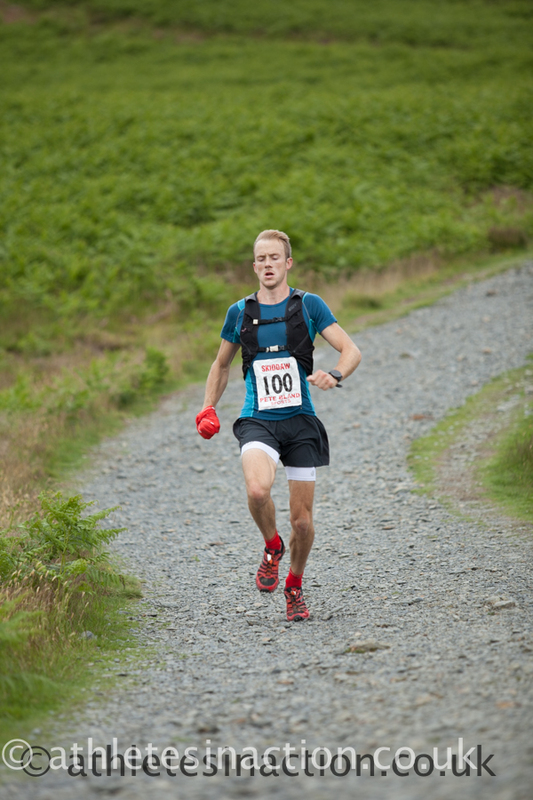 The course was 15km in total with a total climb of 900m, straight up Skiddaw and back down again. Thanks to Mark’s expert pacing on the running sections the day before my legs felt ok and thankfully the breakfast had somewhat digested. I started to wonder how I would compare to fell runners. Growing up in Essex I had heard stories about the legendary people who run up and down mountains in record time, flying up with impressive speed and hurtling down in controlled recklessness. And now I was here, about to take part in one, it seemed like a small dream come true. 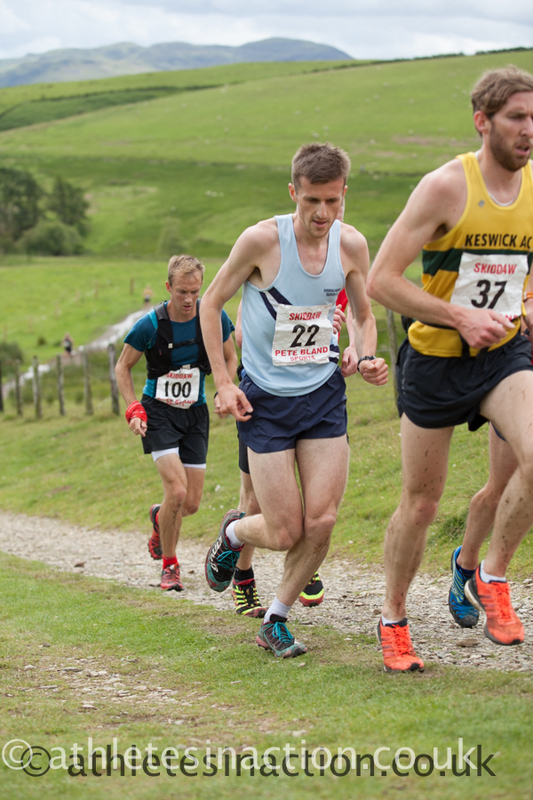 To add another twist I found out the course was being used as a qualifier to represent England in uphill running. So some runners would be speeding to the top where they would finish and simply walk back down. I was in it for the full experience though and there was no way I would miss a classic full speed fell race descent like I had heard and read about. The start was how I imagined it to be – classically low key. The speed of the first km was definitely not low key though as the lead pack blasted away. I was clinging onto the back of it trying to stay cool knowing I might be a little out of my league. A combination of some hard weeks training and some great races recently had actually prepared me well and as the climb started in earnest I found myself sifting through to the front. About half way up I was leading and was wondering if I was making a mistake, ‘too hard too early?’ I felt ok but ‘how big was this mountain?’. I could hear the sound of a race number flapping in the wind behind me but managed to stay cool. We had traveled from the town, through the trees, through the ferns, through the heather, through the grass and we were now getting into the rock and therefore nearing the top. Still in first I risked a look back… I still had a gap but it wasn’t much, would these guys be doing the descent? Or finishing at the top? I had no idea but there was only one thing for it. Spinning around the top I was now in the descent and started hurtling. The rules were to stay to the path which was eroded and rocky making it technical but I knew if fell racers would be good at anything, going downhill was it. A wave of joy overcame me as I was lost in the feeling of concentration and free fall. To run a proper fell race in my home country has always been a dream and now here I was doing it and doing it I was. Halfway down and still in first I wondered how long I could keep this up. The landscape was changing again, now in reverse, and it wasn’t long until I was back in the trees, I glanced at my watch 1 hour two minutes, the legends of old would be finishing about now but I had another few minutes to race yet. Turning the final corner I was over the line and relaxed for the fist time in the 23 minutes it took me to get down. 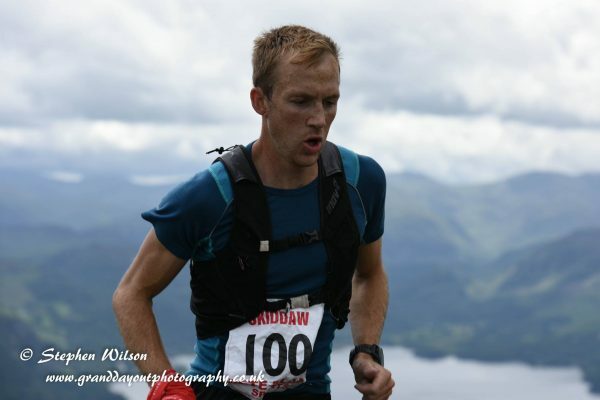 I have taken part in a few mountain races now but none have given me the proud feeling I got from crossing the line in a classic race, in some spectacular English mountains, against some hardy English mountain folk.